The 2009 and third edition of the GS Challenge was a success! 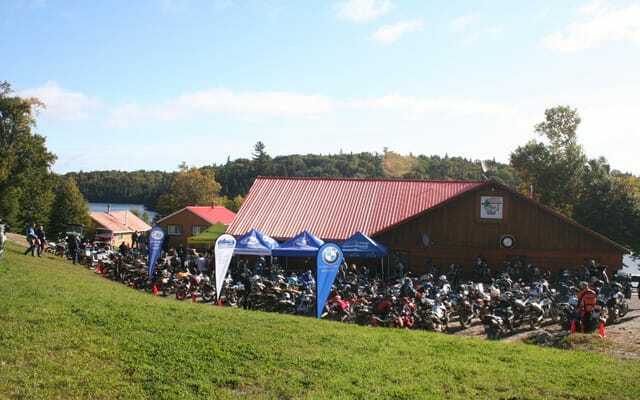 The third edition of the Canadian GS Challenge took place last September 18, 19 and 20, organized by Marc Fontaine in collaboration with Charles Gref jr, Moto Internationale and BMW Motorrad Canada. 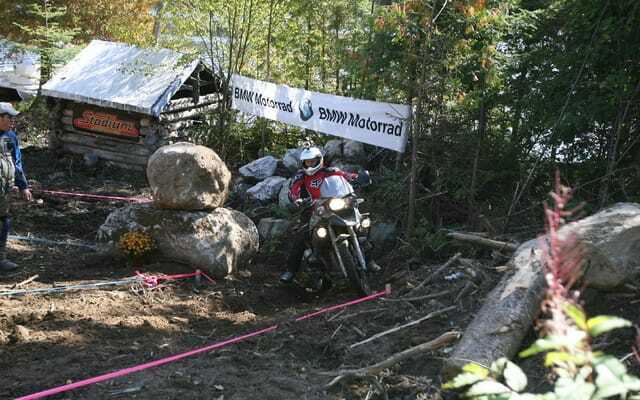 “I’ve attended many motorcycle events and launches throughout the world and I can say the Canadian GS Challenge is of international calibre” stated Bertrand Gahel, journalist and author of the Guide de la Moto. That comment reflects the culmination of an unforgettable event obtained by the efforts put together by promoters and coordinators. World renowned guests such as 2009 Dakar contestant Andrés Memi from Argentina, Joe Stather and Corinna Ziebarth from Touratech Germany and the BMW Argyll team from Alberta participated in this year’s edition. Everything was in place for a great week-end: sunny weather, 75 enthusiasts (including 4 women) and fantastic itineraries which categorized as Panoramic (beginner), Challenge (intermediate) and Double Diamond (advanced). Every team of riders had the opportunity to use their technical competences accordingly. Itineraries were made out of sand, gravel, water and of course a few mud trails. The kickoff was in Montreal and continued on gravel roads from l’Ascension, approximately 80 km north of Mont-Tremblant. The bikes rolled for another 50 km and each team of three initiated the itinerary of their choice. Each itinerary reckoned ability sections and control points where the teams met to sum their points. The GS Challenge is a competition but an amicable one where team work and bonding are at the heart of the values the organisation wants to promote. Therefore, speed is not a winning criterion and strict rules are consequently put in effect. Enthusiasts arrived at the outfitter around 6 p.m. and everyone was smiling. After taking possession of their gift bag and taking a shower, they all met at the bar before dinner to talk about their stories. An electrifying ambiance animated the room. On Saturday morning the low-speed ability contest began. 9 technical events were evaluated and granted points by the panel of judges. The 5 best finalists driving a BMW motorcycle of 1000cc or more to complete the contest were to qualify for the finals on Sunday. 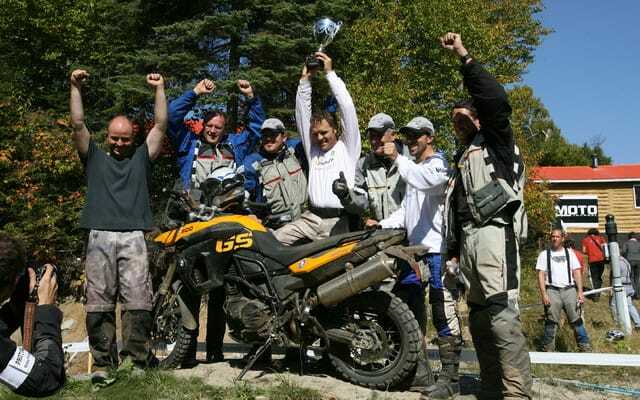 The winner of that last contest would take part of the team representing Canada at the North Africa GS Trophy in 2010. Everybody pushed their limits to accomplish the technical events. After a good lunch, participants headed in the forest for another 60 km defined with all types of obstacles. The narrow trails were absolutely magnificent and the sky was blue. Some paused and took the time to take pictures or film while others helped their teammates get out of the mud. Needless to say the bikes were dirty! As the riders said, a BMW bike is nicer when dirty! Saturday night after a succulent mechoui dinner, we all attended the prize-giving ceremony for the winning teams and a session of door prize draws offered by our generous sponsors. Sunday morning the individual finalists competed: Patrice Glaude, Dominique Lemaire, Christian Coupal, Jean l’Écuyer and Martin Roy. The pilots’ nervousness was tangible as they all were aiming at the same goal: being the best to obtain his place in the Canadian team. 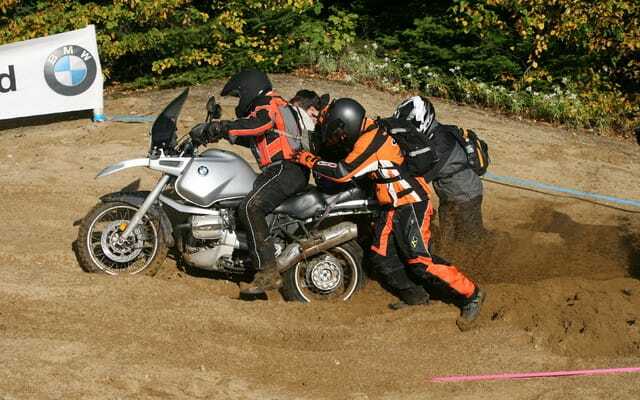 Every technical event was accomplished with a BMW F800GS. At this point everything counted and self-control was indispensable because if one foot touched the ground, wheels were immobilized or a fall occurred points were lost. The participant to lose fewer points was to be made the winner. Upon two hours of encouragements, held breaths and applause, the winner was chosen: Dominique Lemaire was going to be part of the Canadian team! The winner of this prestigious and well-deserved prize was ecstatic. The end of the GS Challenge was getting near and people were getting ready to get back to their homes. Everybody was proud and happy of the ending week-end and were to return home as better pilots as they were when they arrived. They were going back with great memories of laughing with friends, getting out of the mud, getting a bike up or simply having surpassed their limits. Mission accomplished for all the organization team, which is already thinking about the 2010 GS Challenge. It will be up to you not to be just a spectator but a participant!